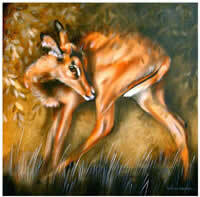 Helena Fourie graduated in fine arts at the University of Pretoria in 1987, where she majored in painting. Since 1994 she has been working as a professional artist. Early in her career, she excelled in realism and started specializing in portrait painting. Inspired by her absolute passion for nature Helena Fourie has been devoting herself to the painting of wildlife, redefining this genre, and applying it in an individual and idiosyncratic style. Helena Fourie painted extensively for clients throughout South Africa, Namibia, Zimbabwe and the United States of America. She was commissioned to paint a mural and several paintings for the official residence of the State President in Pretoria. Her work includes many commissions for murals and tromp-loei'l in Safari lodges, guesthouses, casinos and restaurants throughout South Africa and Zimbabwe. Helena Fourie partakes in group exhibitions and held her first solo exhibition in September 2000, titled African Bestiary, at the Tina Skukan Gallery in Pretoria. In January 2001, one of her paintings was auctioned at the annual Hunters Convention in Houston Texas, for nature conservation. 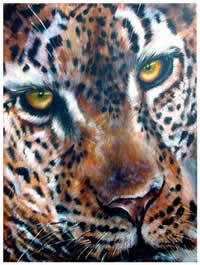 Helena Fourie works in a variety of media, including oil, color pencil, and mix media. 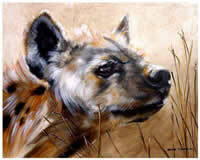 Her work is a journey of hidden discoveries; this is wildlife art with a difference.